If I had to pick one fish to eat for the rest of my life (though I would never want to! ), it would have to be Trout! It is so tasty and just so beautiful and full of flavor. I love it! This is a nice one pot/roasting tin recipe to make a lovely dinner anyone would be over the moon to eat. The juices from the fish mix with the veg and the potatoes and impart beautiful flavor to them as they cook. It really smells so amazing when cooking, that you can not wait to eat it! I made it last time while my mum was visiting recently, and annoyingly forgot all about taking the final photo of the cooked fish before we all devoured it all! Preheat oven to 200 C or 400 F.
Place the sliced onion, and fennel, potatoes in the roasting tin Drizzle a tbsp and half of olive oil, add salt and pepper and toss well to coat them well with oil and seasoning. Bake on mid shelf in the oven for 20 minutes. Mix the fennel fronds and chopped dill with the capers. Season the inside of the trout and fill with this caper stuffing. Place a bay leaf, cubes of butter and sliced lemons inside the fish too. Mix together the fish stock and vermouth. Remove the vegetables from the oven and stir well. Reduce the oven temperature to 180C or 350F. 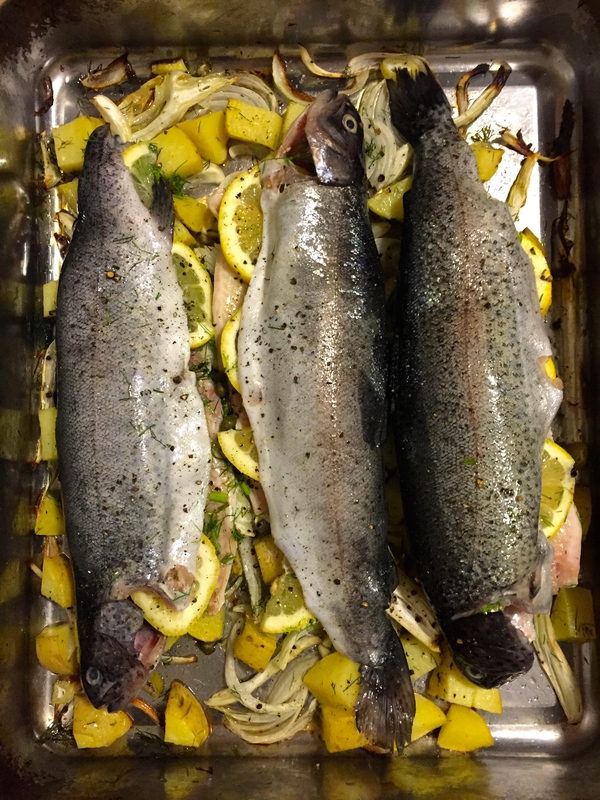 Carefully lay the trout over the vegetables and pour in the stock and vermouth over the fish. Sprinkle the trout with salt and pepper and a tablespoon of olive oil. Cover the tin with foil and bake for 45 minutes or till the trout is cooked through. The flesh should feel flaky through the skin and the inside will be opaque when cooked. Move the fish to the serving platter, and place tin on stove top until the juices bubble and reduce to a nice sauce consistency. Now add the cream and cook for a minute. Stir in some more fresh dill and season to taste. Spoon the vegetables around the fish on a platter, and pour over a little of the lovely sauce. Enjoy!